Your car can introduce air from the outside, or it can recirculate air that’s already in the car. It’s not a completely closed system – there’s always air coming in from the outside because your car is not airtight – but it minimises the amount of air introduced directly from outside the car. This is useful in situations where there might be pollution outside the car – e.g. you are following a smokey vehicle. It’s also useful to turn off when you’ve created your own pollution inside the car and you want to replace it with fresh air. Turning the air onto recirculate will fog up your windows unless you turn the air conditioning on, too. In winter your car will heat up more quickly if you use the heater on recirculate as the heater then draws previously heated air from inside the car. 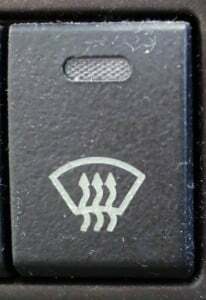 Look for this button in the main air conditioning controls. Adjusting your seat for comfort and control will give you a less tiring ride and will mean that if you need to take urgent action, you’re in the right position. You will need to be able to reach all pedals, hold the steering wheel with slightly bent arms, and reach all the wands and stalks behind the steering wheel. If you can also reach the dashboard without leaning forward too much that’s a bonus. You need to be sitting high enough to see through the front windscreen, and to position your mirrors so that you can see out of the back window and to the side of the car. Some vehicles will have all manual controls for the seat, while others will have multi-faceted electronic seats with memories for different drivers and even electronic headrest adjustment. The controls will be on the door or on the side of the seat. More and more gadgets need power. 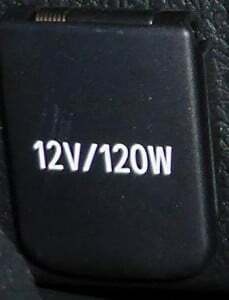 If you’re a heavy user of gadgets like phones, GPS systems and in-car cameras then you can give them power by connecting them to the 12v/120W system in your car. This is the same as the old cigarette lighter. You can purchase adapters that will convert the charge to USB to power your phone, or you can buy adapters that will power small games machines for your rear seat passengers. 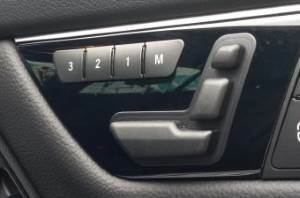 These sockets can be located in various places in your car – in the central binnacle (storage box between the seats), on the dashboard, on the back of the central binnacle (so that rear seat passengers can plug in directly), and even in the boot. If your wing mirrors are adjusted properly you will minimise your blind spots. Most new cars have electronic wing mirrors and the control will vary, but all of them will involve you selecting whether you want to adjust the left or right mirror, and then a four-way adjustment (in, out, up or down). Some cars have systems which will fold the mirrors in automatically when you park, and others give you the option to do this with a button. 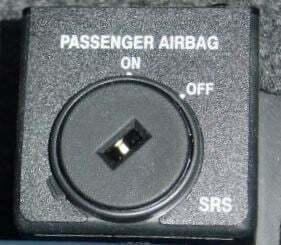 Look for this feature on either the driver’s door, or very near it on the dashboard. Your front windscreen washers will most likely consist of two dual-nozzle sprayers on the bonnet, or a sprayer connected to each windscreen wiper. At the rear you will have a single, centrally mounted sprayer at the top of the screen (if you have a rear windscreen wiper at all). Look for the feature on your windscreen wiper wand. There will be a small fluid tank in the bonnet for the water for the washers. When this gets low some cars will show a warning light in the instrument cluster (where the speedo is). Sometimes you just don’t need your wipers on all the time. If it’s not raining fast enough to keep the windscreen lubricated then your wipers will start to vibrate and rub, and that means you are wearing out your wipers faster than you need to. Look for a collar on the windscreen wiper wand or stalk and it will have perhaps 3-6 settings for different speeds, from almost continuous down to once every few seconds. 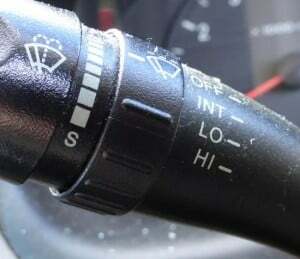 If your car has rain-sensing wipers than you might just have an ‘auto’ option which will decide for you how frequently to wipe. 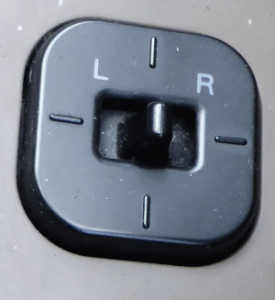 Your front window can fog up very quickly and manufacturers often offer a feature where if you press the button that looks like this, it turns the air conditioning on, directs all air to the windscreen and turns the fan up full. This will clear the windscreen as quickly as possible. It also means that you don’t need to take your eyes away from the road for too long. Window locks can be useful to prevent children playing with the windows (particularly closing the window on their hand or neck), or pets inadvertently treading on the window control in the rear (not that you should be transporting pets unrestrained). Pushing this button means that only the driver has control over the electric windows. Trip computers measure metrics about your car. At the simplest level they offer counters for your journey; at the most complex level they supply average fuel consumption, instantaneous fuel consumption, average speed, distance to empty, distance travelled, distance remaining, distance since last filled with fuel, and more. Learning how to use your trip computer effectively means that you can adjust your driving to be more economical, and you can tell how far you have to go on longer journeys. 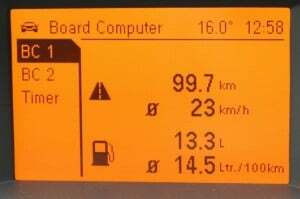 The location of the trip computer will either be in between the speedometer and rev counter, or on a screen in the dashboard. If you want to carry a bag in a rear-facing child seat in the front seat of your car you need to turn the front airbag off. This is because if the front airbag hits the back of the child seat it could cause fatal injuries. If your car doesn’t have one of these, then don’t carry your infant in a rear-facing seat in the front passenger seat. Sometimes the temperature is displayed in a trip computer (as above), and sometimes it’s displayed somewhere else. You can use the temperature to determine whether there might be ice on the road (if it falls to below 3C then it’s likely, and some cars will even display a warning if this happens), and if it’s any hotter than around 15C then you shouldn’t leave a pet in the car at all. Don’t do this while you are driving! 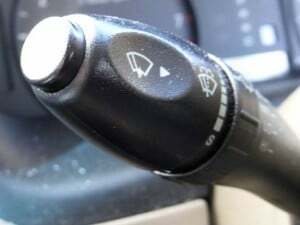 You will be able to adjust your steering wheel up and down, and perhaps forwards and backwards (rake) by dropping a lever and moving the wheel. The following video shows you how to adjust the steering on a Honda Accord, and the method is similar for most cars.